Keyes-Davis G.I. 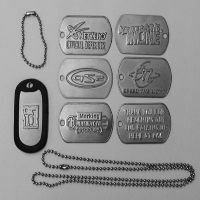 Dog Tags are made to government specifications from stainless steel, with rolled edges. They can be stamped to your specifications. We can have a special stamp made to represent your logo or favorite art work. If you want just letters and numbers we can do that too. We carry 24" neck chains and 4.5" toe chains and black silencers. Call or fax your request for more information.